After a week of brooding, the overweight man finally wonders about the student’s question rather than blame him for asking it. As he walks home on an icy road pondering his answer, he slips, hits his head violently on the ground and has a spiritual awakening. His life would never be the same. Within a month, he loses 30 pounds naturally and effortlessly. Within a year, he reaches his ideal weight (and is still there 40 years later!). Even his eyesight improved. He no longer needed eyeglasses, which he had worn since childhood. Losing weight and improved health weren’t the only dramatic changes that occurred. He freed himself from heavy psychological baggage. And went on to become a best-selling author and one of the fore most experts on personal transformation and conscious relationships inspiring thousands. These stories will challenge the myth that truly meaningful life changes have to take a lifetime to achieve. And although these life-changing moments often do come about in a dramatic way, is this really a requirement? The book will also explore how we can invite more of these moments into our lives and how to make the most of them once they do occur. So do you have a life-changing moment after which your life was never the same? Is there something you’ve gone through that might help others going through a similar situation? If so, I would love to hear about it—and so would they. It doesn’t matter who you are or what you do. (You may even remain anonymous if you choose.) Your story could end up in this eye-opening book where so many others can learn from. And you don’t have to be a “writer” to submit a story. Editing help will be provided. If you prefer, we can set up a time that’s convenient for you to be interviewed over the phone or in person. What was your life like before your life-changing moment? What was your life-changing moment? What happened? How did it change your life? What did you learn from it? What insights did you gain? How is your life different today with regard to that moment? Story length may vary anywhere between 250 and 2,500 words. Please email your story to frank@frankgjata.com Please include your contact information. If you have any questions, feel free to email or call me as well. 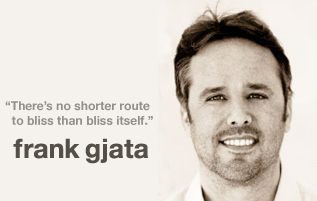 Frank Gjata is a life/consciousness coach (certified through The Hendricks Institute), writer, speaker and social entrepreneur. Frank assists people in living consciously through the practice of acknowledging and speaking the truth, cultivating presence, authentic communication and the breaking of old unconscious patterns–and does it all with a sense of humor. He was recently the featured coach at The Hendricks Institute and is currently putting together a book on people’s most powerful life-changing moments, The Moment That Changed My Life Forever. He’s the founder of Blississippi, My Naked Guru and Conscious Ink.